When he was first introduced to martial arts at age 9, Stéphane Vien didn’t know he was also making his first steps on his professional path. In 1980, when he was barely 19 years old, he already was at headmaster of a martial arts school. His teaching career had launched! True to himself, Stéphane would not stop there. 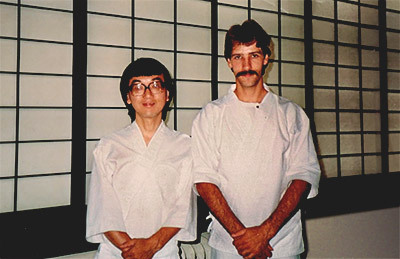 In 1983, he began his studies in shiatsu and in Chinese medicine. As early as 1985, he started his career both as a teacher and as a shiatsu therapist. 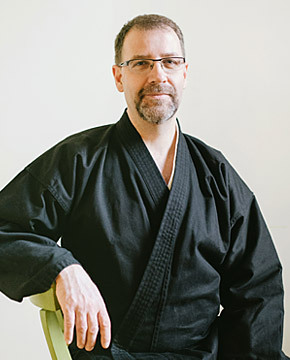 In 1993, Kiné-Concept, a reputable massage therapy school in Montréal, Canada, entrusts him with a mission: to develop a training program in shiatsu-do and in shiatsu according to the teachings of Master Masunaga. Since then, Stéphane, who still supervises the program, has been focusing on training the next generation of shiatsu practitioners and teachers. Today, with over 30 years of experience, Stéphane shares his knowledge, his know-how and his social skills in Canada and abroad. In addition to the one-year education in shiatsu according to the teachings of Master Masunaga, he gives conferences and intensive trainings on different topics: reading of the face, kiology, Peripheral reading of meridians, etc. In parallel with his teaching, Stéphane keeps his private practice in company of those he calls his “teachers.” His long years of experience allowed him to realise that it is his clients who give him the most precious teachings on humans and their ability to heal. Today, people from as far as Europe come to benefit from his expertise and his know-how. 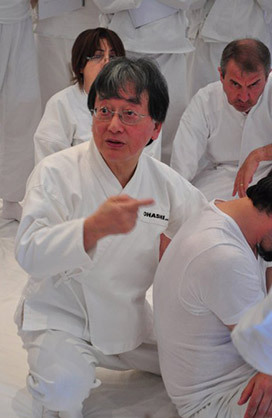 Sensei Ohashi is a world-renowned master of shiatsu and the founder of the Ohashi Institute in New York. He has also written six books on shiatsu and made about 10 DVD’s on the method he is known for: the Ohashiatsu. A respected and appreciated speaker and teacher, he has trained generations of practitioners and therapists in shiatsu, both in America and in Europe. Despite his busy schedule, Sensei Ohashi continues to treat some clients, among which are many well-known figures in show-business and politics. Mr. Stéphane Vien first came to take my workshop when I was teaching in Montreal, Canada in the early 1980s. He then decided to come to New York City to continue in the Ohashiatsu Institute’s graduate program. Over the next 5 years or so, he commuted by bus and stayed at the YMCA. After graduation, Stéphane still wanted to continue his study with me. So he returned to New York City many times. He also spent many summers with us, attending our Summer Retreats at the Dai Bosatsu Zendo Temple in the Catskills in upstate New York. Recently, in 2012, Stéphane invited me to come to Montreal to teach. I found that he was the same aggressive and demanding student as before. Whenever Stéphane comes to study with me, he always asks me to teach him more. He is so aggressive and demanding. He is so dedicated. Over the last 40 years, I have taught more than 40,000 students all over the world, but I have never encountered a student so aggressive and so dedicated as Stéphane Vien. I feel so scared to teach a student like Mr. Stéphane Vien. This is because I must study, experience, and advance so much before he finds out that I do not know what I am teaching him. I find that Mr. Vien is like the “probation officer” checking up on what I don’t know and what I do know about my work! For so many years, Stéphane has also given me lots of spiritual fear, intellectual pressure, and occupational harassment. I hate this kind of student, but at that the same time, I honor and respect this kind of student the most. Without the kind of student like Mr. Vien, I would never be motivated – motivation usually from fear – to enrich my teaching over the last 40 years. I became “the Ohashi,” a famous, respected, and successful “Sen Sei” because I have students like Mr. Stéphane Vien.